Now is the winter of every sports fan's discontent. The sports page these days all too often reads like a rap sheet, if not a treatise on advanced pharmacology. With the football season over, the weeks drag on in eager anticipation of spring training and March Madness. Maybe that's why Neil Swidey's The Assist, about a remarkable inner-city basketball team, seems to have arrived at the perfect time. Aptly subtitled Hoops, Hope, and the Game of Their Lives, the book introduces us to Jack O'Brien, the near-legendary coach at Charlestown High School in Boston, whose life "seemed to begin and end with basketball." His devotion to his players' well-being helped keep them off the streets and, in many cases, secured them college scholarships. His successes -- including four state championships in a row -- derived in great part from a "tough love" approach. "Off the court, the man was usually soft-spoken and helpful, if always relentless," Swidey writes. "But on the court, he was a monster, throwing balls, making the guys get on the line to run sprints for the slightest infraction." Much of The Assist focuses on two of O'Brien's recent standouts, Ridley Johnson and Jason "Hood" White. During their senior year, they tried to help O'Brien bring home yet another state title, but their biggest challenges involved far more than punishing practices and endless drills. Early in his life, Swidey writes, Hood had "turned into the archetype of the angry young black male, a hardened kid with a quick temper, icy glare, and fists always at the ready. He became only more steely after two of his cousins, who had gotten caught up in the street life, were killed." Despite O'Brien's best intentions, Hood found himself beset by legal troubles that threatened to derail his college career before it could start. Swidey, an award-winning journalist for the Boston Globe Magazine, quickly converts his readers into genuine fans of these young men. Like O'Brien, he shows a fanatical devotion to his subject. He follows the team off the court and into the projects, to pizza parties and prestigious tournaments. 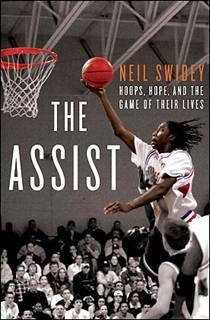 The Assist will prove indispensable to anyone interested in the art of coaching at any level or in any sport. And by distracting us from the sordid, steroid-fueled headlines, Swidey reminds us why we enjoy watching sports in the first place. -- Andrew Ervin is a writer whose short story "The Phillie Phanatic" is in the current issue of Fiction International.